Congratulations to all of the new grads out there! So what to get the recent grad in your life? Stickers! (Plus, a pretty container to keep them in. ): Currently, Lego stickers are the most sought after in my room. Generally, I find that current craze/trendy stickers are “better” than generic seasonal ones. Also, be sure to have lots of boy friendly options. Prize box and prizes: I kind of loathe the prize box, but I allow trips on birthdays and for some kids that require this level of motivation, I’ll do it. Be sure the box closes tight and fill with an assortment of inexpensive party favor type items. Socks! Is it just me, or does everyone find themselves kicking off shoes to play on the floor? At one out-patient rehab gym, we were required to. So, show off cute socks! Seasonal/theme options are fun here especially if the wearer can coordinate with therapy themes. Books: Summer beckons and that new grad will be so excited to finally get around to pleasure reading. Last summer I read Eye Contact and Say What You Will (click here for the review). The Orange Houses , The Silence of Murder , The Memory Keeper’s Daughter: A Novel and The Curious Incident of the Dog in the Night-Time are other communication disorder-related titles. Bonus, the Curious Incident is currently being performed on Broadway if you’re looking to go big ticket! Restaurant gift certificates: I was so spent after a full work day that I could barely throw together dinner–and I love to cook. Gift certificates to local, casual eateries (bonus if they have call ahead take-out) would have been a life-saver. Phone Calls for Advice: Huh? New grads have so much info they ae dying to share, but they aren’t yet getting expert recognition in the work place. Call to ask questions like, “my neighbor’s granddaughter is two and not talking. They’re wondering if they should just give it another year” type questions. It will give them a chance to practice their explanations to a layperson and gain confidence in their new skills. Treatment Materials: A lot of the next few years will be spent amassing a collection of go-to toys and therapy materials. Classic items like blocs, food sets, simple puzzles and board games are always appreciated. (I would go classic here, and avoid trendy themes that won’t last long.) 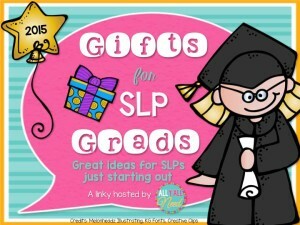 A TPT gift certificate can go a long way too!